We conducted triaxial friction experiments on the shallow Nankai Trough accretionary sediments at confining pressures, pore water pressures, temperatures close to their in situ conditions, and axial displacement rates (Vaxial) changed stepwise among 0.1, 1, and 10µm/s. The results revealed that their frictional properties change systematically according to the content of clay minerals, smectite in particular. The steady-state friction coefficient (μss) at Vaxial = 1µm/s decreases with increasing clay mineral content, shown in weight percent, from 0.82 for a sandstone sample (6 wt%), through 0.71 for a tuff sample (≈17 wt%), and 0.53 to 0.56 for siltstone samples (29 to 34 wt%), to 0.25 for a claystone sample (42 wt%). Slip-dependent frictional behavior changes accordingly from slip hardening for the sandstone sample, through quasi steady-state slip for the tuff and siltstone samples, to distinct slip weakening for the claystone sample. Although all samples exhibit velocity-strengthening behavior upon stepwise changes in sliding velocity, the ratio of the (a − b) value to the velocity dependence of steady-state friction (∆μss/∆lnVsliding) decreases with increasing clay mineral content, which implies that the friction component decreases while the flow component increases accordingly. Thus, faulting in the shallow Nankai Trough accretionary prism is likely controlled by the clay mineral content, in particular the smectite content, in the sediments as well as in the fault zones. Sediments on the incoming oceanic plate at subduction zones are mainly composed of hemipelagic sediments and terrigenous turbidites, which, together, are scraped off to form an accretionary prism (e.g., Underwood 2007). This is also true in the Nankai Trough subduction zone, as revealed by the recent Integrated Ocean Drilling Program (IODP) Expeditions 316, 322, and 333 (Screaton et al. 2009; Underwood et al. 2010; Expedition 333 Scientists 2012), part of the Nankai Trough Seismogenic Zone Experiment (NanTroSEIZE). 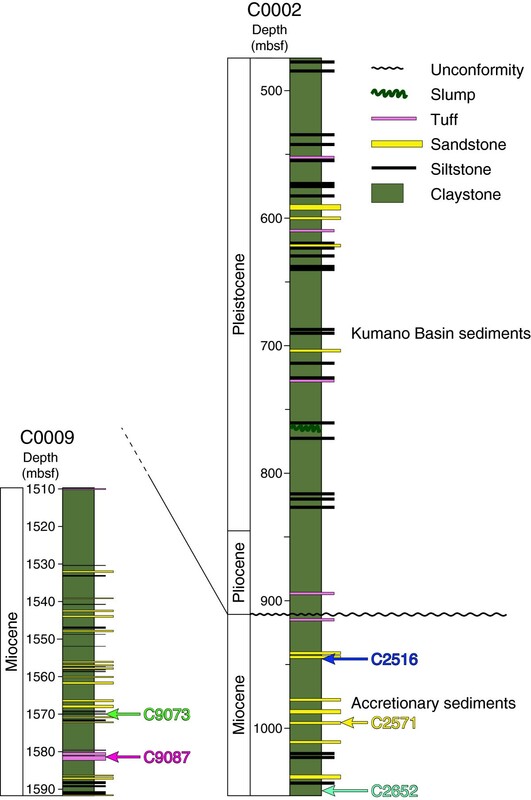 NanTroSEIZE IODP Expeditions 315, 316, 319, and 338 also revealed that the shallow (≤2,000 m below the seafloor) Nankai Trough accretionary prism is largely composed of claystone with subordinate siltstone, sandstone, and tuff (Ashi et al. 2009; Screaton et al. 2009; Expedition 319 Scientists 2010; Strasser et al. 2014). In order to evaluate the frictional properties of accretionary sediments in the Nankai Trough, friction experiments have therefore been conducted exclusively on cored mudstone (siltstone and claystone) samples (Hirose et al. 2008; Ikari et al. 2009, 2013; Ujiie and Tsutsumi 2010; Ikari and Saffer 2011; Tsutsumi et al. 2011; Takahashi et al. 2013). However, frictional properties of minor lithologies should also be investigated in order to fully evaluate the frictional properties of accretionary sediments. Here, we report the results of triaxial friction experiments on sandstone, tuff, and siltstone samples cored from the shallow Nankai Trough accretionary prism, in addition to experiments performed on claystone and siltstone samples already reported by Takahashi et al. (2013). Their frictional properties are found to change systematically according to their content of clay minerals, in particular of smectite. The Nankai Trough is a convergent plate margin where the Philippine Sea plate is subducting northwestward beneath the Eurasian plate at a rate of 4 to 6.5 cm/year (Seno et al. 1993; Heki 2007; Figure 1). An accretionary prism is developed landward of the Nankai Trough (Figure 1). The Shikoku Basin sediments, composed of hemipelagic sediments and terrigenous turbidites, are actively accreting at the deformation front (Screaton et al. 2009; Underwood et al. 2010; Figure 1b). An in-sequence thrust package of accreted sediments occupies the space between this deformation front and the outer ridge (Figure 1b). The outer ridge was likely formed by out-of-sequence thrusting along the ‘megasplay’ fault branching from the master décollement (Park et al. 2002; Moore et al. 2007; Figure 1b). Landward from this outer ridge off Kii Peninsula, the forearc Kumano Basin sediments unconformably cover the older accreted sediments (Figure 1b). Geologic setting. 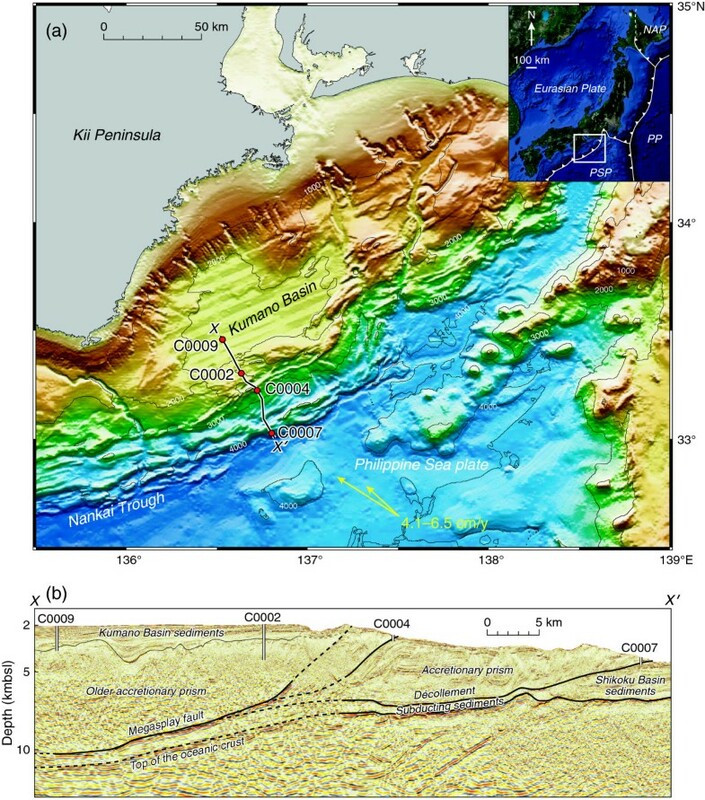 (a) Locality map and (b) seismic profile showing IODP Sites C0002 and C0009 off Kii Peninsula, Japan, where samples tested in this study were cored. Two other sites referred to in the text are also indicated. The inset at the top right in (a) is an index map of Japan (©2013 Google and ©2013 TerraMetrics) showing the location of map area in (a). NAP, North American plate; PP, Pacific plate; PSP, Philippine Sea plate; kmbsl, kilometers below the sea level. Line X-X′ is the composite seismic line for the seismic profile shown in (b). Yellow arrows are convergence vectors between the Philippine Sea plate and Japan (Seno et al. 1993; Heki 2007). The map in (a) is modified after Underwood et al. (2010), while the seismic profile of (b) is provided by Y. Nakamura of the Japan Agency for Marine-Earth Science and Technology. The Nankai Trough subduction zone has been the site of recurring, typically tsunamigenic great earthquakes larger than Mw > 8.0, including the 1944 Tonankai Mw 8.2 and 1946 Nankai Mw 8.3 earthquakes (Ando 1975; Hori et al. 2004). Recent tsunami and seismic waveform inversions, seismic reflection studies, and mud breccia analyses suggest that the coseismic slip during the 1944 Tonankai earthquake occurred along the megasplay fault (Tanioka and Satake 2001; Park et al. 2002; Kikuchi et al. 2003; Sakaguchi et al. 2011; Park and Kodaira 2012). In addition, slow slip events or very low frequency earthquakes have recently been found to occur not only within the accretionary prism, but also along the décollement between the outer ridge and the deformation front (Ito and Obara 2006; Sugioka et al. 2012). The recently installed Dense Oceanfloor Network System for Earthquakes and Tsunamis (DONET) has begun to monitor the seismic activity around this region in detail (Nakano et al. 2013). We tested five samples of four different lithologies cored by D/V Chikyu from Hole B at Site C0002 and Hole A at Site C0009, both located in the Kumano Basin, during IODP Expeditions 315 and 319 (Figure 1). The unconformity boundary between the Miocene accretionary sediments and the overlying Pliocene-Pleistocene Kumano Basin sediments occurs at ≈ 922 mbsf (meters below the seafloor) in Hole B at Site C0002 and at ≈ 1,285 mbsf in Hole A at Site C0009 (Figures 1b and 2; Expedition 315 Scientists 2009; Expedition 319 Scientists 2010). Samples C2516, C2571, and C2652 come from 944.64, 995.52, and 1,048.99 mbsf, respectively, of Hole B at Site C0002, while samples C9073 and C9087 come from 1,569.99 and 1,581.40 mbsf, respectively, of Hole A at Site C0009 (Figure 2; Table 1). 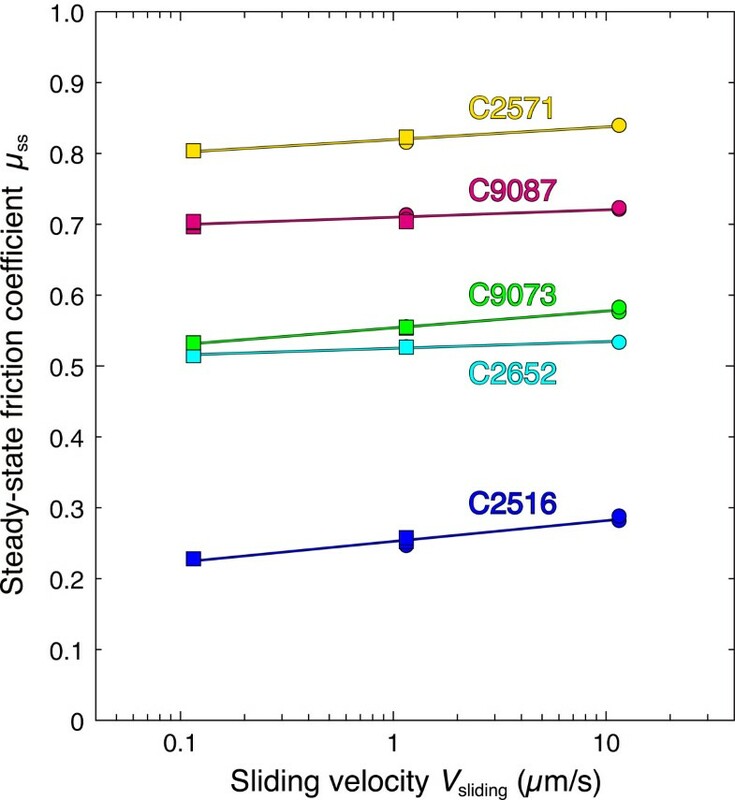 Samples C2516 and C2652 have already been tested by Takahashi et al. (2013), and samples C2571, C9073, and C9087 were additionally tested in this study. Locations of the five samples tested in this study. Columnar sections of Hole B at Site C0002 (right; Expedition 315 Scientists 2009) and Hole A at Site C0009 (left; Expedition 319 Scientists 2010). mbsf, meters below the seafloor. mbsf, meters below the seafloor. According to temperature profiles estimated based on down hole temperatures and thermal conductivity on cores and cuttings measured at Sites C0002 and C0009 (Expedition 315 Scientists 2009; Expedition 319 Scientists 2010), in situ temperatures of samples C2516, C2571, and C2652 from Site C0002 are estimated to be 33°C to 35°C, while those of samples C9073 and C9087 from Site C0009 are estimated to be ≈ 47°C (Table 1). From the overburden stresses calculated from the least-squares fitted profiles of densities measured onboard D/V Chikyu (Expedition 315 Scientists 2009; Expedition 319 Scientists 2010) and the water column above the seafloor, in situ pressures of samples C2516, C2571, and C2652 from Site C0002 are estimated to be 36 to 38 MPa, while those of samples C9073 and C9087 from Site C0009 are estimated to be ≈ 57 MPa (Table 1). Assuming a hydrostatic condition, which was found to be true down to 1,460 mbsf from testing at Site C0009 during IODP Expedition 319 (Expedition 319 Scientists 2010), in situ pore pressures of samples C2516, C2571, and C2652 from Site C0002 are estimated to be 28 to 29 MPa, while those of C9073 and C9087 from Site C0009 are estimated to be ≈ 43 MPa (Table 1). We prepared petrographic thin sections of the samples and observed their optical microstructures. We also conducted powder X-ray diffraction analyses of the samples. After qualitative analyses to check the constituent minerals, we conducted quantitative analyses following the method described by Chung (1974). We used quartz as the reference mineral and prepared a powder mixture of equal weights of synthetic quartz and each constituent mineral within the sample to be analyzed. From an X-ray diffraction profile of each mixture, the peak-height ratio of a specific diffraction plane of each mineral to that of quartz was obtained. The peak-height ratio of the same diffraction planes from an X-ray diffraction profile of the sample to be analyzed then provides an estimate of relative weight of that specific mineral with respect to quartz. This method, although not very precise, gives a rough estimate of the modal composition in weight percent. In addition, we measured the porosities of the samples using a mercury bath and a helium porosimeter for bulk and pore volume measurements, respectively, at the Technology and Research Center of the Japan Oil, Gas, and Metals National Corporation. For the triaxial friction experiments, we used a gas-medium, high-pressure, high-temperature triaxial apparatus at the Active Fault and Earthquake Research Center of the Geological Survey of Japan (Masuda et al. 2002). The pressure media for confining and pore pressures were argon gas and distilled water, respectively. Hollow pistons enabled pore water to flow through the specimen being tested. Two independent servo-controlled pressure intensifiers enabled us to apply both confining and pore pressures of up to 200 MPa. The axial load was measured by a load cell attached to the lower piston inside the pressure vessel. We prepared simulated gouges with grain sizes smaller than 250µm from crushed and sieved core samples. As described in Takahashi et al. (2013), the specimen assembly consisted of a cylinder of porous Shirahama sandstone, 20 mm in diameter and 40 mm in length, containing a 0.65-g (≈0.5-mm-thick) gouge layer along a sawcut inclined 30° to the cylinder axis; a pair of porous tungsten-carbide spacers; a pair of alumina spacers; and upper and lower stainless-steel pistons. This assembly was then jacketed by a heat-shrink Teflon® tube. 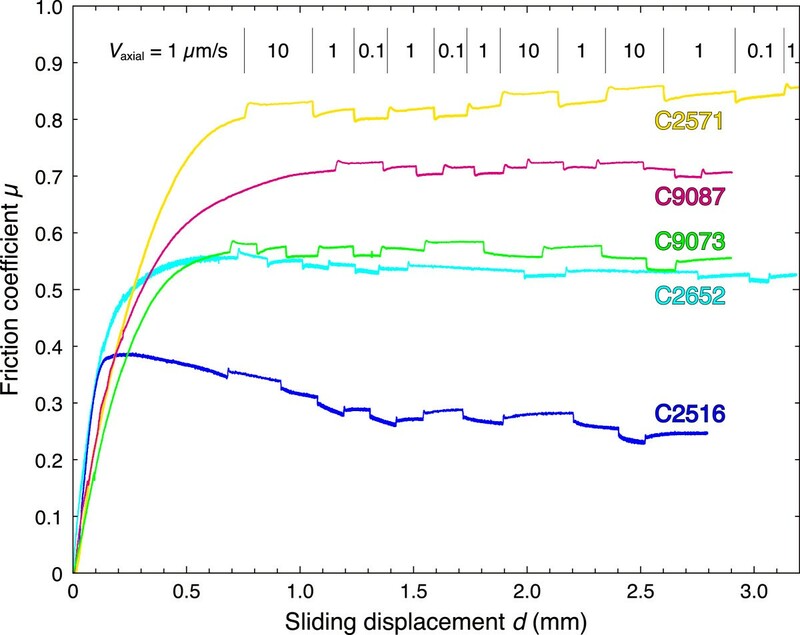 We conducted friction experiments on simulated gouges as prepared above at a room temperature (≈15°C), confining and pore pressures close to their in situ conditions (Table 1), and axial displacement rates (Vaxial) changed stepwise among 0.1, 1, and 10µm/s, i.e., at sliding velocities (Vsliding) along the sawcut changed stepwise among 0.1155, 1.155, and 11.55µm/s, and monitored the differential stress with increasing axial displacement. Although the experimental temperature was 20°C to 30°C lower than the in situ temperatures (Table 1), the difference is very small at this temperature range and duration time of the experiments. We have thus conducted experiments at confining pressures, pore water pressures, and temperatures close to their in situ conditions. Shear and normal stresses acting on the gouge layer were calculated from the differential stress and effective confining pressure, and corrected for the Teflon® jacket strength. Their ratio gives the friction coefficient (μ) of the gouge. The axial displacement was converted into sliding displacement (d) along the sawcut. Sample C2516 is a very fine-grained (mostly ≤5µm), homogeneous claystone (Figure 3a), as described in Takahashi et al. (2013). It contains 13 wt% quartz, 23 wt% feldspar, and ≈ 12 wt% hornblende as clastic grains, and 32 wt% smectite, ≈6 wt% illite, 1.5 wt% chlorite, and ≈ 3 wt% kaolinite as clay minerals (Table 2). The porosity of this sample is 11.2%, which is unusually low compared with the 30% to 50% porosities of accretionary sediments measured onboard at Site C0002 (Expedition 315 Scientists 2009; Strasser et al. 2014). Microstructures of the five samples tested in this study. All except for (d) are optical micrographs taken under plane polarized light, while (d) is an optical micrograph taken under crossed polarized light. (a) Claystone sample C2516, (b) siltstone sample C2652, (c, d) sandstone sample C2571, (e) siltstone sample C9073, and (f) tuff sample C9087. Qz, quartz; Fs, feldspar; Cc, calcite; Hb, hornblende; Pr, pyrite; Gs, gypsum; Smt, smectite; Ill, illite; Chl, chlorite; Kln, kaolinite. 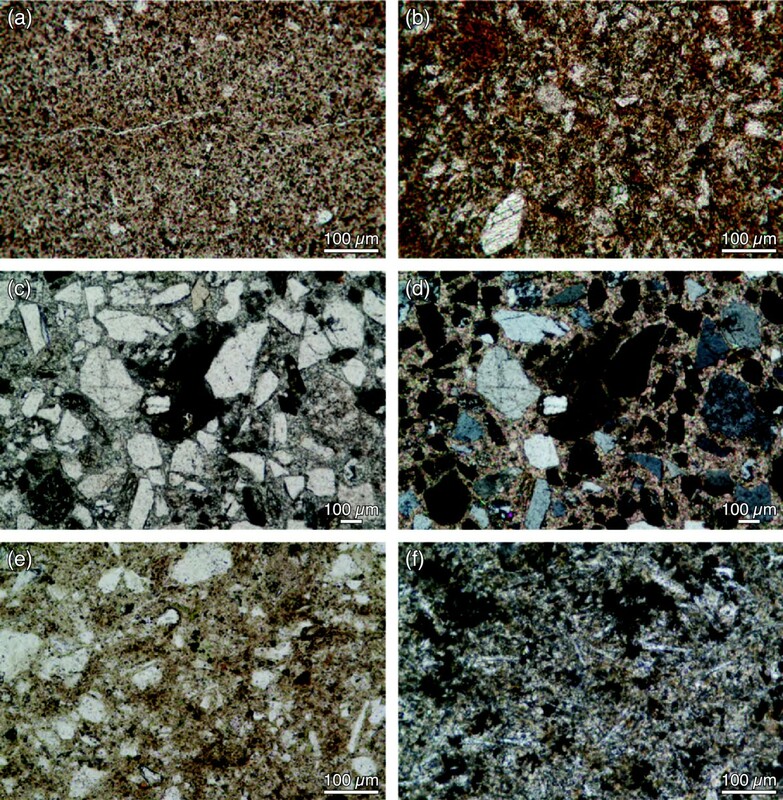 Sample C2571 is a strongly lithified sandstone with angular clastic grains of several tens to several hundred micrometers in size, cemented by calcite (Figure 3c,d). It contains 32 wt% quartz, ≈39 wt% feldspar, and ≈ 9 wt% hornblende as clastic grains; ≈13 wt% calcite as the cementing material; and 3.3 wt% illite and 2.7 wt% kaolinite as clay minerals (Table 2). The porosity of this sample is as low as 0.7% due to cementation by calcite. Sample C2652 is a sandy siltstone (Figure 3b), as described in Takahashi et al. (2013). It contains ≈ 28 wt% quartz, ≈24 wt% feldspar, and ≈ 8 wt% hornblende as clastic grains, and ≈ 25 wt% smectite, ≈6 wt% illite, ≈1 wt% chlorite, and ≈ 2 wt% kaolinite as clay minerals (Table 2). The porosity of this sample is 38.5%, which is within the range of porosity at similar depths measured onboard at Site C0002 (Expedition 315 Scientists 2009). Sample C9073 is also a sandy siltstone containing grains of a few tens to over 100µm in size, in a clayey matrix (Figure 3e). It contains ≈ 32 wt% quartz and ≈ 32 wt% feldspar as clastic grains, ≈5 wt% calcite as microfossil grains, and ≈ 22 wt% smectite, ≈5 wt% illite, and ≈ 3 wt% kaolinite as clay minerals (Table 2). The porosity of this sample is 29.5%, which is within the range of porosity at similar depths measured onboard at Site C0009 (Expedition 319 Scientists 2010). Sample C9087 is a fine-grained (mostly ≤100µm) vitric tuff containing some clastic grains (Figure 3f). It contains ≈ 64 wt% volcanic glass, ≈8 wt% quartz, and ≈ 8 wt% feldspar as clastic grains, and ≈ 12 wt% smectite, ≈3 wt% illite, and ≈ 2 wt% kaolinite as clay minerals (Table 2). The porosity of this sample is 27.4%, which is also within the range of porosity at similar depths measured onboard at Site C0009 (Expedition 319 Scientists 2010). 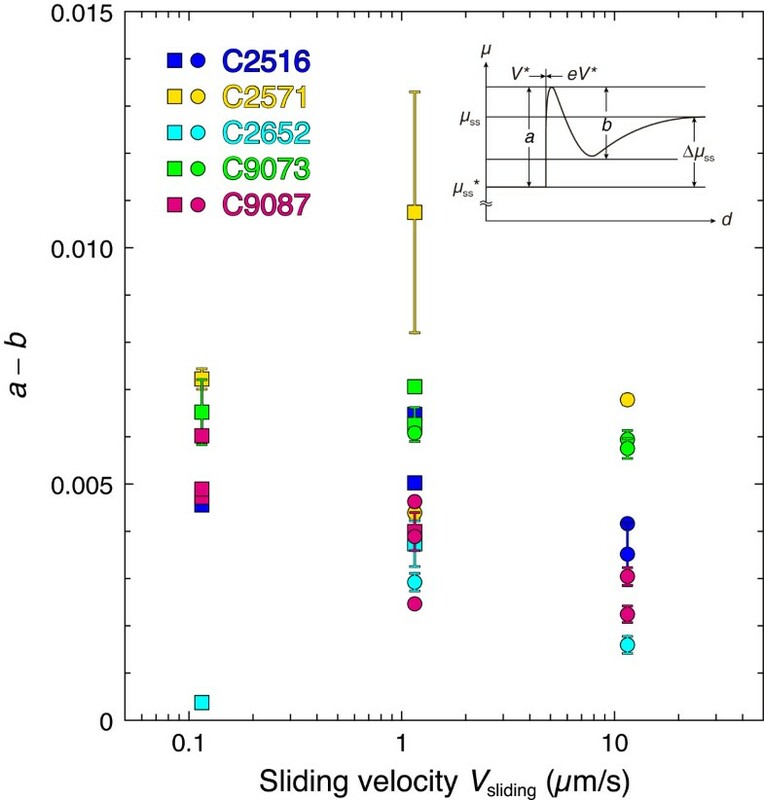 We describe below the change in μ, at Vaxial = 1µm/s, with d. Claystone sample C2516 exhibited distinct slip weakening after reaching maximum μ ≈ 0.38 at d ≈ 0.3 mm until μ ≈ 0.25 at d ≈ 2.8 mm (Figure 4). Sandstone sample C2571 exhibited slip hardening after reaching μ ≈ 0.80 at d ≈ 0.75 mm until μ ≈ 0.87 at d ≈ 3.4 mm (Figure 4). Siltstone sample C2652 exhibited slight slip weakening after reaching maximum μ ≈ 0.56 at d ≈ 0.7 mm until μ ≈ 0.53 at d ≈ 3.2 mm (Figure 4). Another siltstone sample, C9073, exhibited quasi steady-state slip after reaching μ ≈ 0.56 at d ≈ 0.7 mm (Figure 4). Tuff sample C9087 also exhibited quasi steady-state slip after reaching μ ≈ 0.71 at d ≈ 1.15 mm (Figure 4). Friction coefficient μ plotted against sliding displacement d for gouges of five samples tested in this study. The sequence of steps in axial displacement rate (Vaxial) is shown only for sandstone sample 2571, but the same sequence was applied to all the other samples. See Table 3 for experimental conditions. All samples exhibited velocity-strengthening behavior as shown by an increase in μ when Vaxial was increased, and vice versa (Figure 4). The difference between the decayed friction levels before and after a stepwise change in Vaxial is largest for the sandstone sample, C2571, while it is the smallest for the siltstone sample, C2652 (Figure 4). As already described in Takahashi et al. (2013), claystone sample C2516 exhibited an asymptotic change in μ following instantaneous and decayed responses after a stepwise change in Vaxial (Figure 4). Such frictional behavior had also been observed during friction experiments on serpentinite (Reinen et al. 1991; Takahashi et al. 2011) and has been ascribed to a flow component during frictional sliding (Takahashi et al. 2011, 2013). We fit the observed friction data with the mixed friction-flow law proposed by Takahashi et al. (2011, 2013). At each velocity step after d = 1.5 mm, we determined the parameter (a − b) defined by the rate- and state-dependent friction constitutive law (Dieterich 1979, 1981) (Figure 5) and the steady-state friction coefficient (μss) after the flow response (Figure 6) (cf. inset in Figure 5). We used friction data after d = 1.5 mm in order to avoid the effects of slip hardening or weakening and picked only data for which fitting was successful. The (a − b) values are positive for all samples, ranging from 0.0004 to 0.0107 (Figure 5). The (a − b) values of each sample tend to decrease with increasing Vsliding (Figure 5). At each Vsliding, the (a − b) values of sandstone sample C2571 and siltstone sample C9073 are relatively large, while those of siltstone sample C2652 and tuff sample C9087 are relatively small (Figure 5). Average and standard deviation (a − b) values for each sample are shown in Table 3. The μss values increase linearly with increasing logarithmic Vsliding for all samples (Figure 6). The least-squares line fitting of these data gives the ratio of incremental μss to incremental logarithmic Vsliding (∆μss/∆lnVsliding), i.e., the velocity dependence of steady-state friction. The ∆μss/∆lnVsliding value and its error for each sample are also shown in Table 3. The ∆μss/∆lnVsliding value ranges from 0.0041 to 0.0127 (Table 3). The ∆μss/∆lnVsliding values of claystone sample C2516 and siltstone sample C9073 are relatively large, while those of siltstone sample C2652 and tuff sample C9087 are relatively small (Table 3; Figure 6). Values of ( a − b ) plotted against sliding velocity V sliding for the five samples tested in this study. Vertical bars indicate error bars. Squares are (a − b) values after stepping down in Vsliding, while circles are those values after stepping up in Vsliding. The inset illustrates the mixed friction-flow law of Takahashi et al. (2011, 2013), where the steady-state friction coefficient (μss) after a stepwise change in Vsliding from V* to eV* is reached after a flow response following the direct and evolutionary effects (a and b). d, displacement; μ, friction coefficient; μss*, steady-state friction coefficient at V*; ∆μss, difference between μss and μss *. Steady-state friction coefficient μ ss plotted against sliding velocity V sliding for the five samples tested in this study. Least-squares fitted lines are also shown. Squares are μss values after stepping down in Vsliding, while circles are those values after stepping up in Vsliding. T, temperature; RT, room temperature; Pc, confining pressure; Pp, pore pressure; Vaxial, axial displacement rate; Vsliding, sliding velocity; μss, steady-state friction coefficient; a − b, difference in instantaneous and decayed responses after an e-times stepwise change in sliding velocity; ∆μ ss /∆lnVsliding, ratio of incremental steady-state friction coefficient to incremental logarithmic sliding velocity. See text for details to determine μss, (a − b), and Δμss/ΔlnVsliding values. The μss at Vaxial = 1µm/s for each sample is obtained by inputting the corresponding Vsliding value (1.155µm/s) to the equation of the least-squares fitted line shown in Figure 6 (Table 3). The μss at Vaxial = 1µm/s differs according to lithology; sandstone sample C2571 has the highest μss of 0.82, tuff sample C9087 has the second highest μss of 0.71, siltstone samples C2652 and C9073 have similar μss of ≈ 0.55, and claystone sample C2512 has the lowest μss of 0.25 (Table 3; Figure 7). 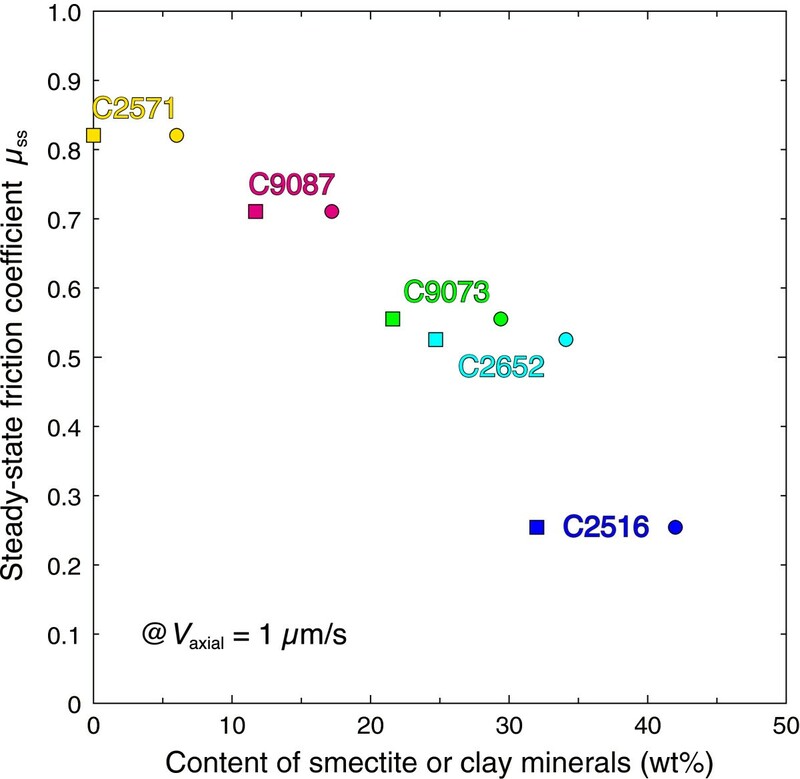 μ ss plotted against smectite/clay-mineral content for the five samples tested in this study. Steady-state friction coefficient μss at an axial displacement rate (Vaxial) of 1µm/s is plotted against the content of smectite (squares) or clay minerals (circles). Values of μss are obtained by inputting the corresponding Vsliding value in the equations of the least-squares fitted lines shown in Figure 6. Our triaxial friction experiments revealed that samples of different lithologies are not only different in steady-state frictional strength, but also in slip-dependent frictional behavior (Figures 4 and 7; Table 3). These differences in frictional strength and behavior according to lithology are attributable to their different clay mineral contents, in particular, their smectite contents, as discussed below. 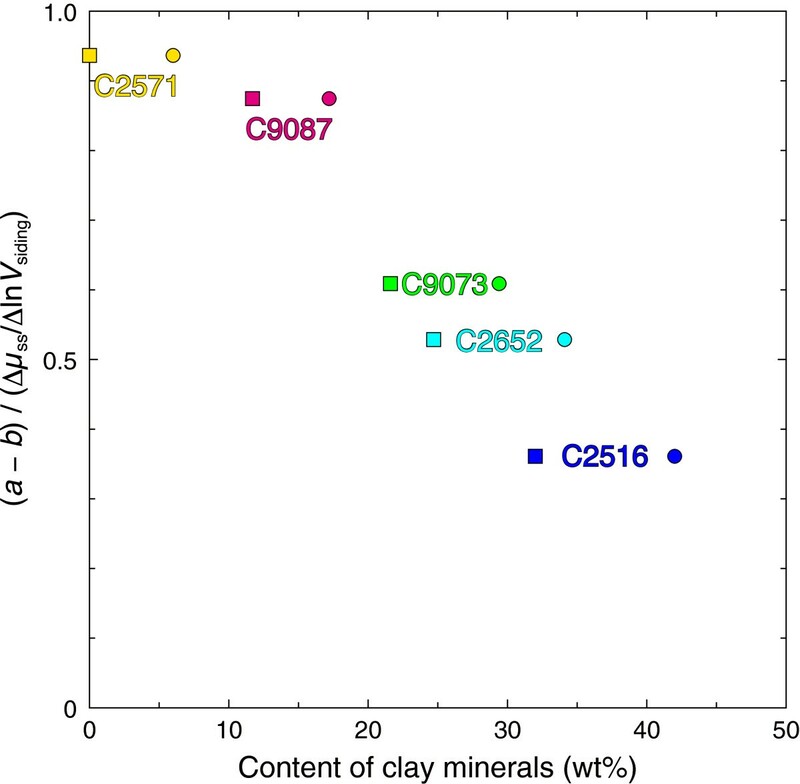 The content of clay minerals differs according to lithology; it is 6 wt% in sandstone sample C2571, ≈17 wt% in tuff sample C9087, 29 to 34 wt% in siltstone samples C2652 and C9073, and 42 wt% in claystone sample C2516 (Table 2). 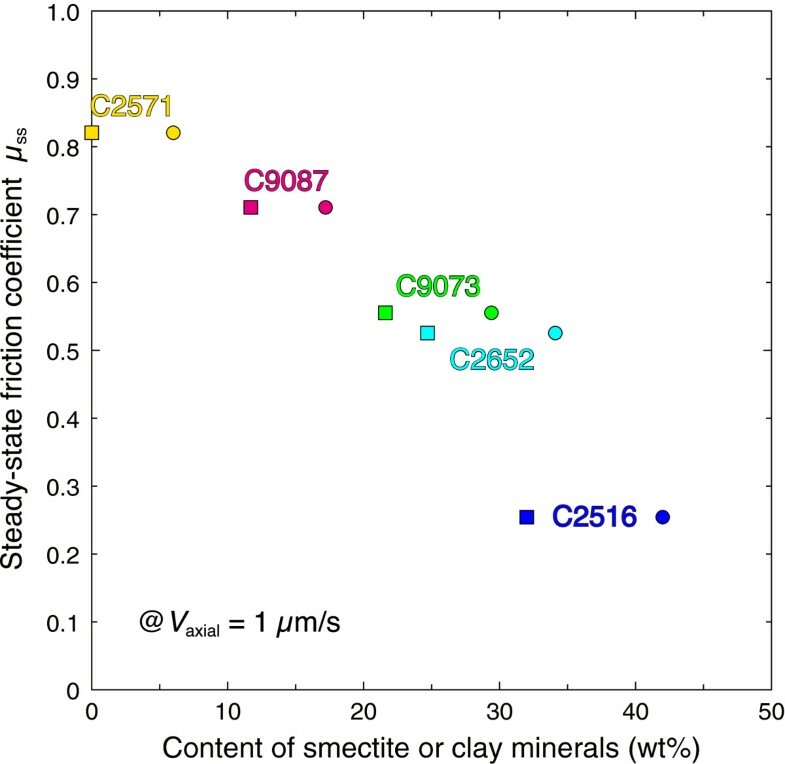 Except for sandstone sample C2571, in which smectite is absent, smectite is the most abundant clay mineral in the samples, comprising 68 to 76 wt% of the total clay minerals (Table 2). Previous friction experiments on gouges of synthetic quartz-clay mixtures revealed that frictional strength decreases with increasing clay content (e.g., Lupini et al. 1981; Rutter et al. 1986; Logan and Rauenzahn 1987; Saffer and Marone 2003; Ikari et al. 2007; Takahashi et al. 2007; Crawford et al. 2008; Tembe et al. 2010; Moore and Lockner 2011). The steady-state friction coefficient (μss) of our accretionary sediment gouges at Vaxial = 1µm/s also decreases with increasing content of smectite or clay minerals (Figure 7). The μss at Vaxial = 1µm/s decreases linearly from 0.82 for sandstone sample C2571 with 0 wt% smectite and 6 wt% clay minerals to 0.53 for siltstone sample C2652 with ≈ 25 wt% smectite and ≈ 34 wt% clay minerals (Figure 7). However, the μss of claystone sample C2516, with 32 wt% smectite and 42 wt% clay minerals, is 0.25, significantly lower than this linear decreasing trend (Figure 7). Takahashi et al. (2007), Tembe et al. (2010), and Moore and Lockner (2011) also reported a linear decreasing trend of frictional strength up to a certain amount of clay minerals, and a drop from the linear trend for larger amounts of clay minerals. This change in rate of strength decrease has been attributed to a change in the load-bearing framework, from quartz-supported to matrix-supported (e.g., Tembe et al. 2010), which occurs at variable clay mineral contents according to experimental conditions, i.e., ≈45 wt% in the experiments of Takahashi et al. (2007) and ≈ 15 wt% in the experiments of Tembe et al. (2010) and Moore and Lockner (2011). Such change likely occurred in our experiments at ≈ 30 wt% of smectite and ≈ 40 wt% of clay minerals. Slip-dependent frictional behavior also changes systematically according to the content of smectite or clay minerals, from slip hardening of sandstone sample C2571, through quasi steady-state slip of tuff sample C9087 and siltstone sample C9073, to slight slip weakening of siltstone sample C2652 and distinct slip weakening of claystone sample C2516 (Figure 4). Such systematic change in slip-dependent frictional behavior according to the content of clay minerals is also consistent with the results of previous studies (e.g., Saffer and Marone 2003; Moore and Lockner 2011). It should be noted, however, that slip-dependent frictional behavior is only transient until a steady-state is reached. Clay-poor gouge samples likely experienced substantial grain-size reduction and compaction, resulting in slip hardening (e.g., Morrow and Byerlee 1989). In contrast, in clay-rich gouge samples, initial compaction hardening was likely followed by weakening due to preferred alignment of clay minerals along shear planes (e.g., Moore and Lockner 2004). Except for siltstone sample C2652 and tuff sample C9087, whose (a − b) and ∆μss/∆lnVsliding values are smaller than those of the other samples, there is a tendency for the (a − b) value to decrease while the ∆μss/∆lnVsliding value increases with increasing clay mineral content (Figure 8). 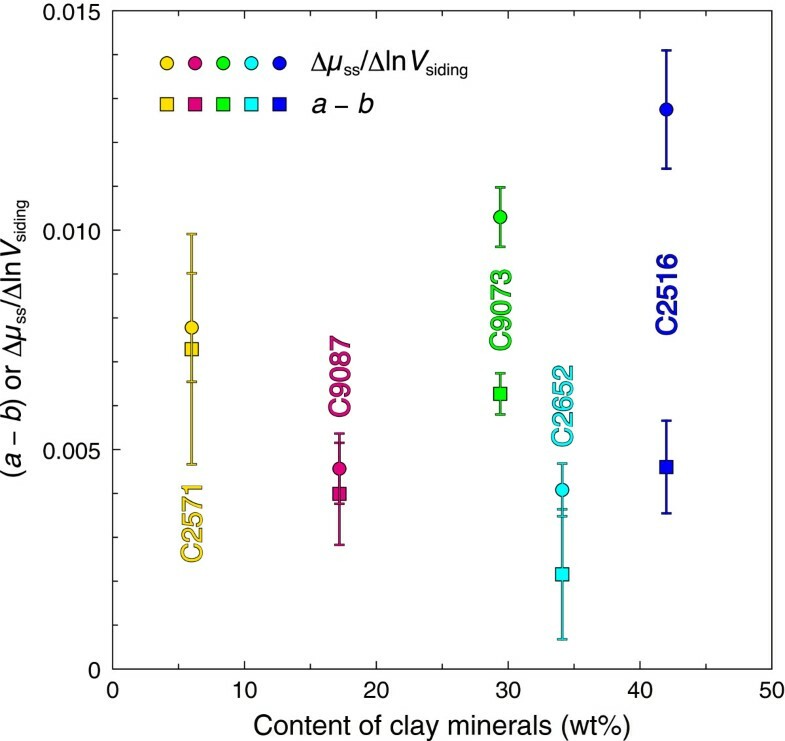 Thus, the difference between the (a − b) and ∆μss/∆lnVsliding values increases with increasing clay mineral content, which is also true for the above two exceptional samples (Figure 8). It is unknown at present why these two samples show exceptionally small (a − b) and ∆μss/∆lnVsliding values, but when we plot the ratio of (a − b) to ∆μss/∆lnVsliding against the content of smectite or clay minerals, it is evident that the ratio decreases with increasing content of smectite or clay minerals (Figure 9). This implies that the contribution of (a − b) defined by the rate- and state-dependent friction constitutive law (Dieterich 1979, 1981) becomes smaller in velocity dependence of steady-state friction as the content of smectite or clay minerals increases. In other words, the friction component in frictional sliding decreases while the flow component increases with increasing clay mineral content (cf., Takahashi et al. 2013). In the case of sandstone sample C2571, the ratio of (a − b) to ∆μss/∆lnVsliding is ≈ 0.94 (Figure 9), so that the frictional sliding of this sample is mostly composed of friction. In contrast, in the case of claystone sample C2516, the ratio of (a − b) to ∆μss/∆lnVsliding is ≈ 0.36 (Figure 9), so that the frictional sliding of this sample is composed mainly of flow. This must be due to the abundance of clay minerals (42 wt%), in particular of smectite (32 wt%), in this sample (Table 2). Thus, our results show that the rate- and state-dependent friction constitutive law alone cannot sufficiently describe the friction characteristics of materials containing a certain amount of clay minerals, in particular smectite. ( a − b ) or (∆ μ ss /∆ln V sliding ) plotted against clay-mineral content for the five samples tested in this study. Values of (a − b) (squares) and ratios of incremental steady-state friction coefficient to incremental logarithmic sliding velocity (∆μss/∆lnVsliding) (circles) are plotted against the content of clay minerals. Squares with vertical bars indicate average and standard deviation values of (a − b) values plotted in Figure 5, while circles with vertical bars indicate ∆μss/∆lnVsliding values and their errors from the least-squares fit shown in Figure 6. ( a − b )/(∆ μ ss /∆ln V sliding ) plotted against smectite/clay-mineral content for the five samples tested in this study. Values of (a − b) relative to ratio of incremental steady-state friction coefficient to incremental logarithmic sliding velocity (∆μss/∆lnVsliding) are plotted against the content of smectite (squares) or clay minerals (circles). Friction experiments on mudstone (siltstone and claystone) samples cored at Sites C0004 and C0007 (Figure 1) during IODP Expedition 316 have also been conducted by Hirose et al. (2008), Ikari et al. (2009, 2013), Ujiie and Tsutsumi (2010), Ikari and Saffer (2011), and Tsutsumi et al. (2011). These studies reported μss of 0.25 to 0.54 and positive (a − b) values with a few negative exceptions at Vsliding ≤ 1 mm/s, which are generally consistent with our results for the siltstone and claystone samples. Ikari and Saffer (2011) reported a dependence of (a − b) values on Vsliding, such that they decrease with increasing Vsliding up to 3µm/s and then increase for faster Vsliding up to 100µm/s, which is similar to our results of (a − b) values decreasing with increasing Vsliding up to 11.55µm/s (Figure 5). They showed that b values have an opposite trend to that of (a − b) values, which we see only for a few samples in our experiments. Ikari et al. (2013) also reported that slip-weakening behavior was common for their samples at Vsliding = 0.1 to 10µm/s, which is also consistent with our result for the claystone sample. However, these studies do not take account of the flow component during their experiments, induced by the presence of clay minerals supposed to be abundant in their samples. Consequently, the velocity dependence of steady-state friction (∆μss/∆lnVsliding) was likely underestimated in these studies. Takahashi et al. (2013) reported, from triaxial compression experiments on claystone sample C2512 and siltstone sample C2652, that the former is weaker than the latter and fails slowly. In addition to its intrinsic weakness due to the abundance of clay minerals, the low porosity and permeability of the claystone sample likely resulted in an increase in pore pressure during its compression, which may have further weakened this sample and promoted its slow failure (Takahashi et al. 2013). It has recently been suggested that the slow slip events or very low frequency earthquakes observed within the Nankai Trough accretionary prism or along the shallow décollement (Ito and Obara 2006; Sugioka et al. 2012) occur in regions of elevated pore fluid pressures (Park et al. 2010; Kitajima and Saffer 2012). Because claystone is likely under a high pore water pressure during its compression, and also because it fails slowly, faulting in claystone layers is a possible source for such slow slip events or very low frequency earthquakes. A significant flow component during the frictional sliding of claystone also favors slow slip. In addition, Ikari et al. (2013) suggested that millimeter-scale slip-weakening behavior at Vsliding = 0.1 to 10µm/s, as observed for the claystone sample in this study, may generate slow earthquakes, which also supports the above hypothesis. Our triaxial friction experiments on samples of different lithologies reveal that the frictional properties of the shallow Nankai Trough accretionary sediments change systematically according to the clay mineral content, in particular the smectite content. With increasing clay mineral content, frictional strength decreases, and slip-dependent frictional behavior changes from slip hardening, through quasi steady-state slip, to slip weakening. Although velocity-strengthening behavior is commonly observed, the friction component in frictional sliding decreases while the flow component increases with increasing clay mineral content. The velocity dependence of friction generally becomes more positive, so that faulting becomes accordingly more stable. Thus, faulting in the shallow Nankai Trough accretionary prism is likely controlled by the content of clay minerals, in particular of smectite, in the sediments as well as in the fault zones. Together with the results of triaxial compression experiments we reported earlier, our results suggest that faulting in claystone layers is a possible source for slow slip events or very low frequency earthquakes observed in the shallow Nankai Trough accretionary prism or along the shallow décollement. We used samples and data provided by the Integrated Ocean Drilling Program (IODP). KK thanks the operation staff of D/V Chikyu and the onboard laboratory technicians of Marine Works Japan for their support. We also thank M. Shimogawara and H. Kaito for assisting with porosity measurements, S. Uehara for assisting with experiments, Y. Nakamura for providing the composite seismic profile used in Figure 1b, KANAME members for discussions, three anonymous reviewers for helpful reviews, and G. Kimura for editorial handling. This study was supported by a MEXT KANAME grant #21107004 to MT and KK. KK obtained the samples and planned the experiments. MT, SA, and HI conducted the experiments, and MT analyzed the results. SA, HI, and AI conducted the XRD analyses, and SA, HI, and KK conducted the porosity measurements. KK drafted the manuscript, and all authors read and approved the final manuscript.